This pH balanced, 2 in 1 shampoo and conditioner is designed specifically for small pets and is free from sulfates and parabens. It is professionally formulated to clean and hydrate the skin and hair while reducing static and adding shine. Note: A full bath could be stressful for your pocket pet, so we recommend just bathing their bottom, or their paws if needed. For more tips read our Rabbit Care Guide. Looking for a shampoo for your dog or cat? Try Rufus & Coco 2 in 1 Natural Wash. Need to stock up on bedding for your bird or small pet enclosure? 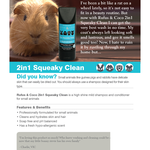 Check out Rufus & Coco Home Squeak Home Premium Pet Bedding. My puppy loves this product it smells great and is easy to use. My puppy is left soft and smelling great. It is also cheaper compared to the other items at pet stores.